Brian Honigman is a marketing consultant, speaker and freelance writer. For more insights on how to be a better marketer, sign up for Brian Honigman’s weekly newsletter. This post originally appeared on the his blog. Social media has been called many things over its short but storied history, but one thing it has almost never been called is “slow.” There’s a common, implicit understanding that the results social media marketing delivers are primarily immediate. The social success stories we constantly hear about are the ones that happen overnight. This conception of social media is prevalent for two reasons. First of all, many social media home runs actually do occur quickly, and secondly (and more importantly) this narrative is much more appealing. It implicitly tells us that we too have the chance to benefit from one of these viral hits. Who doesn’t want to wake up to ten million YouTube views and dozens of calls from reporters? However, the reality (as reality has the habit of being) is a lot less glamorous. Much of the potential benefit that social media can realistically give to brands comes from the long-term benefits of consistent and quality social media content that is promoted strategically overtime. While there are many benefits to consistently strong content, one less obvious benefit is the continuing compounding success of old posts. Most people think that once a post is a day old it is pretty much dead, and that after a week it might as well never have happened. However, things online last forever and none of these posts actually disappear. Social posts only seem to disappear because of their incredibly high volume (orders of magnitude more than new web pages) and most social platform’s favoring of recency in content (for obvious reasons). Even though most social networks might be set up to strongly favor recent posts, nearly all have search and have some sort of functionality enabling users to come across any post, no matter how old. Although this is true, different social sites allow for varying degrees of discoverability. This mostly has to do with how much their user experience and product favors recency or permanence. An easy way to visualize what I’m talking is to think of it as a spectrum. Sites such as Twitter and Instagram place much more of an emphasis on being up to the minute; therefore, their algorithms and search functionality tend to favor posts that are recent. Whereas sites like Pinterest and Google+ tend to lean towards permanence, meaning content posted on these channels have more potential to be discovered long after they have been shared. This fact makes the latter pair a much more viable source of long-term social media benefits. This viability is bolstered by the fact that both Pinterest and Google+ have placed a special emphasis on building out their search functionality. 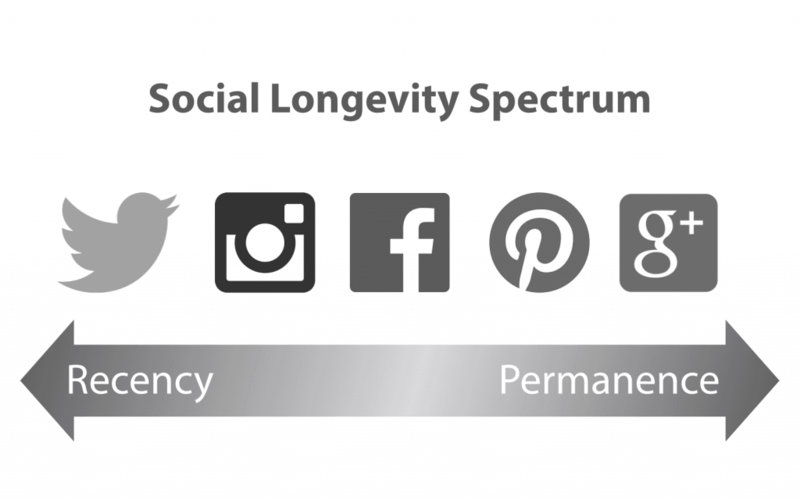 For sites on the left end of the Social Longevity Spectrum search is much less important as users tend to rely on an ever-refreshing ticker of content based on who they follow in conjunction with their recommendation engines (this concept was discussed in length in my content marketing predictions post). Although certain sites favor recency over permanence, the relative distribution of potential viewers of your content over time looks essentially similar. 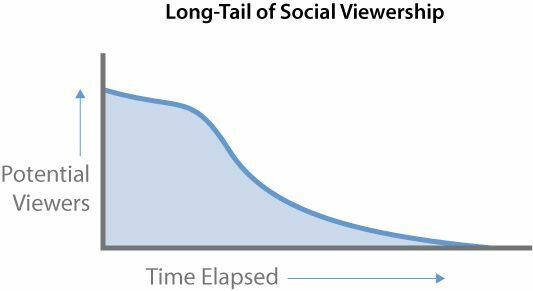 This distribution can be thought of as a typical long-tail taper, with a high potential viewership when little time has elapsed, and then a quick fall-off on viewership as time goes on. This curve will look different for certain sites based on where they fall on the recency/permanence spectrum, but they will all follow this basic shape. The misconception of social’s utility discussed in the intro aims to capture the high degree of attention garnered by a post in the first few hours of posting, but this is a high-competition space. There is a good deal less competition for the long-tail end of this chart. And much like Chris Anderson’s original formulation of the long-tail, this often overlooked opportunity can yield unexpectedly high results. It is an especially powerful strategy for sites that favor permanence over recency. Pinterest and Google+ are fantastic candidates to leverage the long-tail of social viewership for two reasons. Not only do they tend to also favor less recent content, but they both have a strong focus on searchability (this is not entirely coincidental). The argument can be made that all social media platforms rely on a “search engine” of sorts. For example, Facebook’s newsfeed allows users to search for pages, people and interests, most recently even for specific public posts. Similarly, the Facebook “Trends” feature acts like a broader auto-suggest tool for stories that are popular across the social network. This kind of limited search automatically favors content that is more recent and tries to use social connections and trusted sources to limit the need for keyword-based searches. Sites like Google+ and Pinterest, on the other hand, tend to encourage the use of keywords within search, making it much more likely that older content will continue to be discovered and shared in the future. Not only do both Google+ and Pinterest employ a robust keyword search engine, they also have both recently implemented tools to aid in discovery and recommendations. This strongly enhances the odds that your content (so long as it is relatively evergreen) will have the potential to be found and shared long after you first post it. 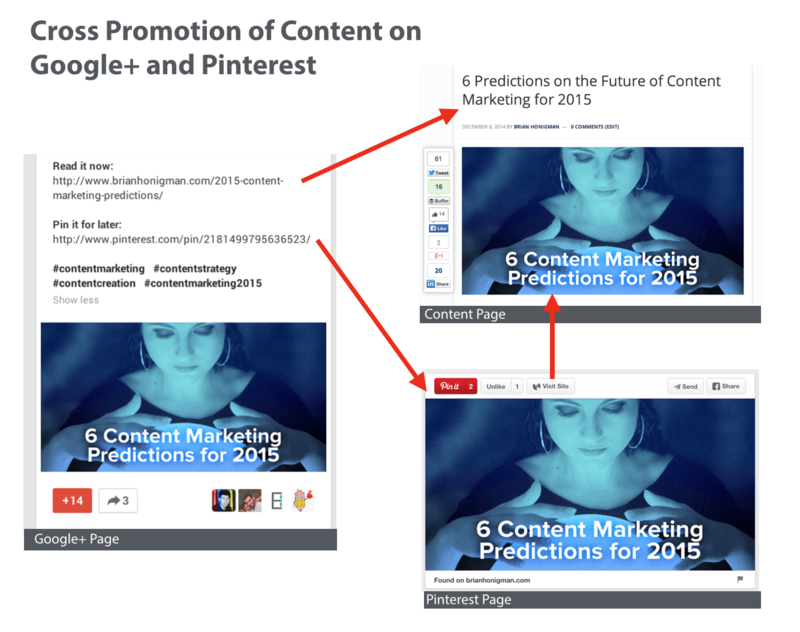 For both Google+ and Pinterest, marketers can also take a closer look at the keyword recommendation engine to help inform what kind of content to post in order to maximize the long-tail viewership that makes these sites unique. Furthermore, if you plan on building a content strategy around this slower-growth, evergreen social strategy, you can even use these tips to help build out your editorial calendar. 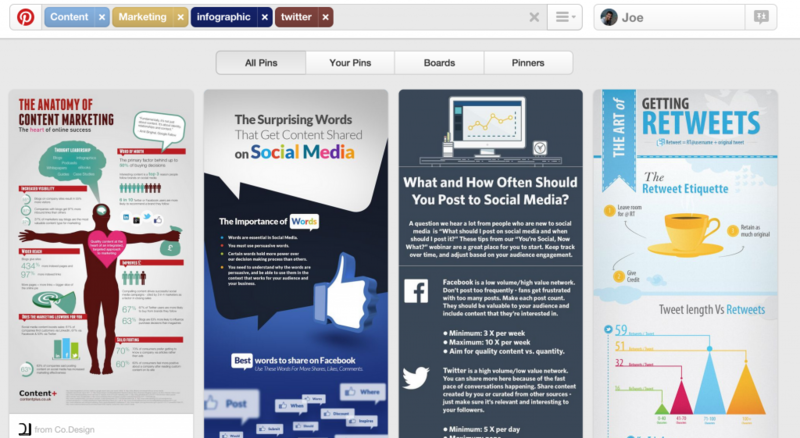 In June 2014, Pinterest announced the release of their what they called “guided search” for their website (they had released a similar feature for mobile a few months earlier). Guided search acts as a highly graphical auto-suggest feature for related keywords and topics. Given how graphically prominent of a feature this is, it is clear that Pinterest is taking the notion of guided search quite seriously. In light of the points made in the previous paragraphs, this focus on recommendations makes sense. If Pinterest values permanence over relevance, then it follows that they would want to open up as many avenues to discovering this content as possible. Just like Pinterest best practices dictate you carefully select niche followers, you should also explore the keyword recommendations for your niche and start focusing on these topics. The new guided search feature allows you to enter up to four filters before displaying final long-tail results. Starting with your highest priority keyword, use the guided search to fill in all four keywords and then examine the top results for that specific query. Use this content as a guide for how to best set up your own content for success in this niche. Using this technique for your Pinterest content can help it achieve remarkable longevity due to its suitability for guided search. Google+ has a feature roughly similar to Pinterest’s guided search and therefore marketers should follow a similar process to tailoring content to Google+’s discovery engine. 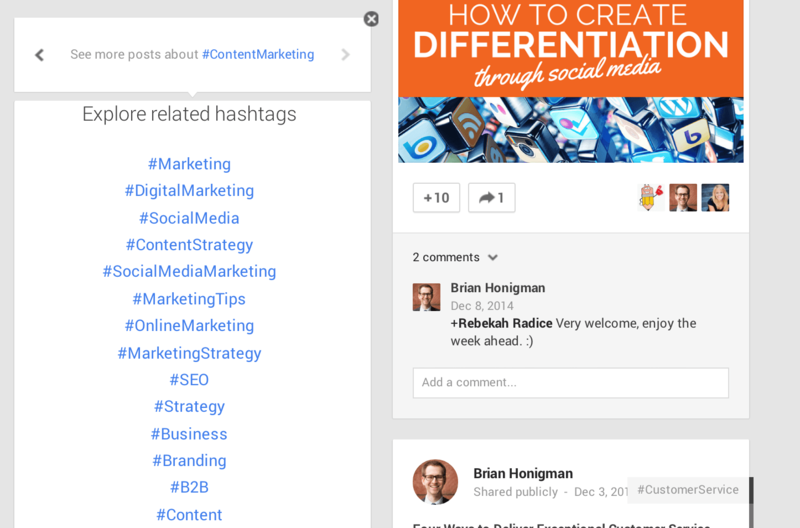 Every post on Google+ is capable of supporting hashtags and these tags show up on the top-right-hand side of the post. Mousing over these tags highlights them and clicking causes the post to flip (this is even similar in graphic emphasis to Pinterest’s guided search) and reveal recommended posts based on the selected hashtag. In addition to recommending related posts, flipping through posts also reveals related hashtags. Flip through enough posts and eventually you are just presented with a list of all the hashtags tangentially related to the core topic you were exploring. In much the same way that an exploration of Pinterest’s guided search can give insight into what topics are likely to be discoverable, an analysis of the content recommended for Google+’s hashtag discovery feature will likely inform the best possible strategy for creating content that has real staying power on Google+. Although one necessary step of leveraging the social permanence of Google+ and Pinterest is setting your content up to be discovered, an equally crucial step is engineering your posts in such a way that once users come across them they take the actions you want. The real value of long-tail social awareness is helping boost content via compounding interest overtime. Essentially, targeted posts on more permanence-oriented social sites have a much better chance of succeeding in the long-run as they acquire more shares and likes. After optimizing your posts for discovery on these platforms, it is important to also optimize them for content amplification. A key strategy for increasing the impact of your posts and ensuring that they actually serve their main function is to leverage cross-promotion. This is something I believe in strongly, because I have implemented it on my own blog and have seen it work for me. An example of a cross-promotional strategy I’ve used can be seen illustrated in the following diagram. While my content will always be anchored on my site, I use permanence-leaning platforms to give that content multiple touch-points for potential discovery. Following the publishing of a post I create a Google+ post that summarizes the main elements of the article to draw readers in. Following this summary I provide two links. One link goes to the original piece, while the other goes to a separate Pinterest post I created specifically to let users bookmark that content. The addition of the link to Pinterest not only provides readers utility (allowing them to save the piece for later reading). A dedicated, optimized Pinterest post also serves as an additional conduit for people to discover my content and my site. This posting strategy helps my posts succeed in the short-term (working in concert with more recency-leaning platforms like Facebook and Twitter), but also helps in the long-term. Here’s an example of such a post on Google+ and another. That is because the posts on Google+ and Pinterest continue to exist as highly discoverable, optimized avenues for users to find and share my content long after they are published. Employing a cross-promotional strategy in conjunction with optimizing content for discovery, can help gradually boost posts. Sometimes, I’ve had posts that I thought died in the night come back from the grave and actually outperform some of the posts that had an initially high spike but low long-term engagement. While it might be more fun to have overnight success (and there’s nothing saying that won’t happen), employing these strategies for Pinterest and Google+ can help set your content up for a slower, steadier path to succeeding on social media. 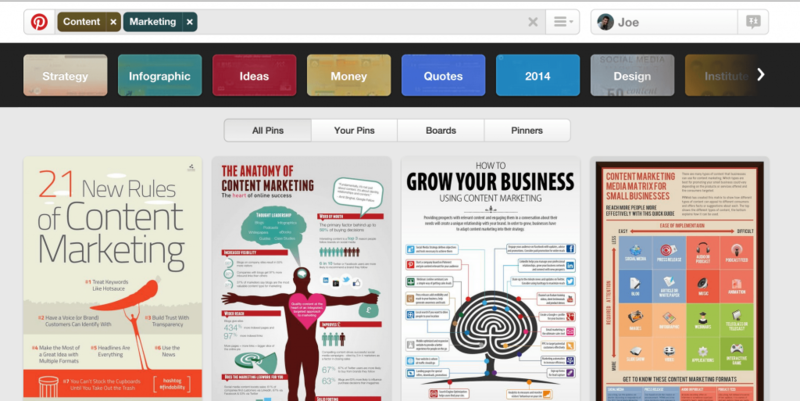 What strategies have you used to leverage Pinterest and Google+? Are there any other permanence-leaning platforms you would recommend? Share your ideas and thoughts in the comments below!